Already at the end of the 19th and the beginning the 20th Century various European scholars, like Patrick Geddes (1854-1932), Wilhelm Ostwald (1853-1932), Paul Otlet (1868-1944) and Otto Neurath (1882-1944) were exploring new ways to organize, visualize and to disseminate knowledge on a global level, encountering similar problems but also coming up with solutions comparable to the Internet and World Wide Web. The Belgian Paul Otlet (1868-1944) together with the politician and winner of the Nobel Peace Prize of 1913, Henry La Fontaine, in the period before the First World War formed several "knowledge" organizations in Brussels: the International Institute of Bibliography (1895), an International Library assembled from the collections of scholarly and other societies and associations in Brussels (1906), an International Museum (1910), the Union of International Associations (1910), and a World University (1920) etc. all combined after the War into what Otlet called the Palais Mondial, later the Mundaneum, an immense physical structure that was part of the Palais du Cinquantenaire in Brussels. A form of the Mundaneum in the early 1990s was re-recreated in Mons, Belgium, as a museum and archive dedicated in large part to the work of Otlet and LaFontaine. From the first, Olet was interested in the ways in which images could be used to simplify and display complex information. "Documentation," a term he coined in 1904, for him involved the mobilization not only written documents but documents of all kinds and he placed a special value on images, schemas, charts, tables and so on. In his view the book was an inconvenient and inefficient carrier of information that had to be decomposed and dissected in order to draw out its essential and most valuable "bits" of information. Recorded separately according to what Otlet called "the monographic principle," each individual item of information could then be reprocessed in various ways for more effective dissemination and use. Late in his life, Otlet's preoccupation with visualization intensified. He began to develop what he called an Atlas Mundaneum (Encyclopaedia Universalis Mundaneum), in which he sought to express the ideas on knowledge organization, visualization and dissemination that he had treated in extenso in written form in his Traité de documentation (1934). 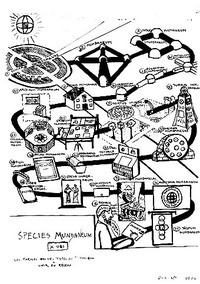 The Atlas Mundaeum was also intended to visualize his views on the emergence of a global society that he had summarized in the sometimes cryptic text of Monde (1935). For the various sections of Atlas Mundaneum, and as he experimented with visual ideas generally, images ranging from scribbles on tiny pieces of paper, to larger pieces more fully developed, sometimes multicolored, to large formal final images in standardized "tableaux" or charts are to be found in their thousands in the Mundaneum in Mons. In the latest of these images Otlet started to experiment with 3D and 4D “mobile” visualizations of information and came up with solutions that are coming close to presentations of changing relations between data in interfaces designed for the computer. 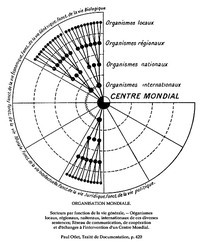 (Fig 2, Click to Enlarge) Otlet, Visualization of Le Plan Mondial in the form a cube moving along 3 axes Mons, Archives du Musée du Mundaneum, EUM, OP 103 : « Le plan mondial » [1934-35]. In this visualization of Le Plan Mondial, the three visible sides of a cube represent 1) the domains, 2) the sectors and 3) the instruments of the world plan. The cube's movement along the three axes labelled : 4 (degree of reach), 5 (space), and 6 (time), would change the relationships between the data. Otlet foreshadows a network to which access is to be had by a screen and a telephone, all that the scholar would ultimately need, he believed, on his work desk. In his Encyclopedia Universalis Mundaneum Otlet visualizes a form of teleconferencing involving the gramophone, film, radio and television, anticipating what we would nowadays call hypermedia. Otlet’s version of the Internet or World Wide Web, has only recently been achieving the multi media and interactive dimensions that he foreshadowed. He imagines an arrangement of multimedia machines illustrated in the next image having an important interactive capability that in effect could create a "virtual" reality. "Cinema, phonograph, radio, television - these instruments considered to be substitutes for the book have become in fact the new book, the most powerful of means for the diffusion of human thought. By radio not only will one be everywhere able to hear one will everywhere be able to speak . By means of television not only will one be able to see what is happening everywhere, but everyone will be able to view what he would like to see from his own vantage point. From his armchair, everyone will hear, see, participate, will even be able to applaud, give ovations, sing in the chorus, add his cries of participation to those of all the others. 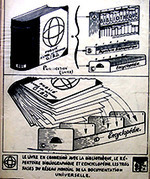 "(Otlet, Traité de Documentation 1934, 431). A pen and ink sketch of 1943, the year before Otlet died, brings together his ideas on a global networked world. We see the Mundaneum once again in the spiral form originally proposed in 1928 by the famous architect, Le Corbusier, for a building for the Mundaneum on the shores of Lake Geneva. However Otlet now shows the Mundaneum not just as a physical structure, a museum, that contains representations of the accumulation of knowledge over time. It is also presented as a global transmitter of knowledge by sound (“radio-telephone”) and by image (“radio-television”). Do you want to purchase cheap xanax? From the first, Olet was interested in the ways in which images could be used to simplify and display complex information. lovely information, just by reading this I know that your blog is great! why ? the program works perfectly!! A pen and ink sketch of 1943, the year before Otlet died, brings together his ideas on a global networked world. A form of the Mundaneum in the early 1990s was re-recreated in Mons, Belgium, as a museum and archive dedicated in large part to the work of Otlet and LaFontaine. si tuviera una duda con respecto a estre sitio donde podria contactarlos para aclararla? o igual me contestan por medio del blog? However Otlet now shows the Mundaneum not just as a physical structure, a museum, that contains representations of the accumulation of knowledge over time. It is also presented as a global transmitter of knowledge by sound (“radio-telephone”) and by image (“radio-television”).